Mocking responses using turtle-run, service-turtle and ng-wedge. What happens to your web application if one of the static libraries takes 10 seconds to load instead of 100ms? Does it stay blank? Does it crash? Does it show the page but then crashes when the user tries to interact with it? What happens if the server responds with a 500 error code to an Ajax request? Do you silently swallow the error, and the user keeps waiting in vain? Does the web application crash? Or does it show a meaningful error message to the user? Is the error sent to the crash reporting service, like Sentry? I consider the web sites that graciously handle run time errors like an occasional 500 server response to be well-built and trustworthy ones. It is a good sign that the team not only has finished working on the regular features but has also properly designed and tested the error handling code paths. From my personal development experience testing all possible intermittent failures is very hard and time consuming. It is very difficult to simulate an occasional 500 error on demand - the feature testing against the staging or production environments assumes the servers are a black box. Adding the ability to simulate the server's failures will surely add unnecessary complexity to the server's code. It also does not allow simulating network delays and responses with an unexpected data formats (two things very common in the real world). turtle-run is a stand alone proxy that runs between the tester and server. It can slow down some requests, or return a specific status code or mock data based on url match. service-turtle is a proxy that runs inside the latest Chrome browser using ServiceWorker technology. It can intercept any HTTP request and return a fake status, and even delay the mock response by a given time period. 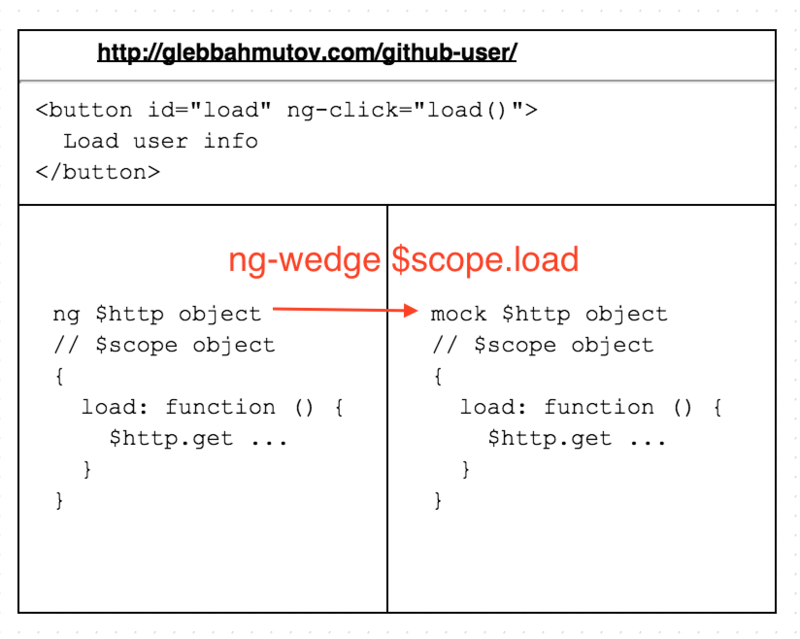 ng-wedge is the last script that can modify the web application's code on the fly. It is the most flexible approach that does not require an intermediate proxy server or an experimental browser API. Unfortunately this approach assumes the tested application uses AngularJS framework and requires good development insight into the application's code. In my opinion it is most useful to the developer who is working on the application. I will show how these proxies can be used to test the web application's robustness to the common errors using a small AngularJS application. 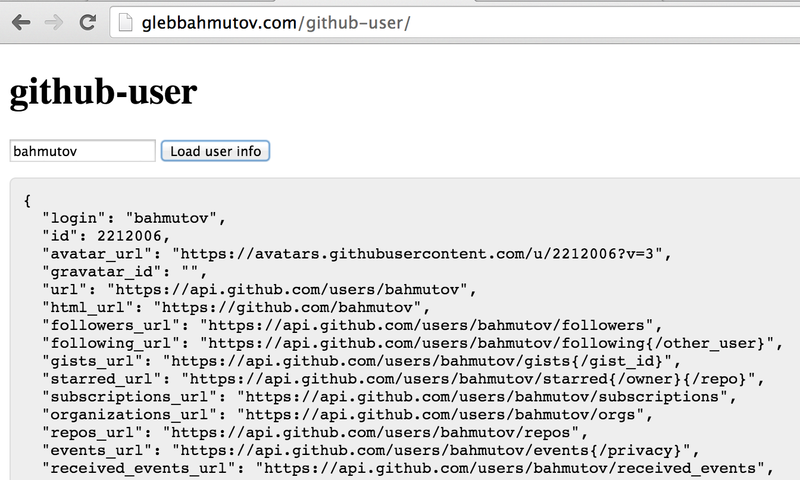 The source code is available at bahmutov/github-user and the live demo is available at glebbahmutov.com/github-user. The application should run in the local browser at localhost:3003. 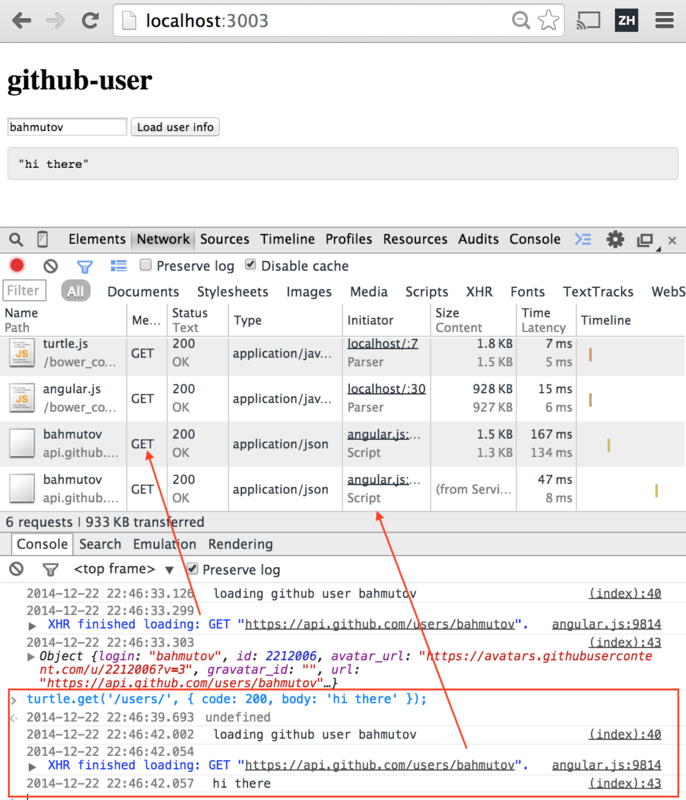 If you enter a github username and click "Load user info" there is separate Ajax request to https://api.github.com. The results should be displayed below the input box. The first thing we want to test is how the application looks when a 3rd party library does not load at all or loads only after a delay. The github-user demo page requires only a single external script to load, and it is included with the repo itself. 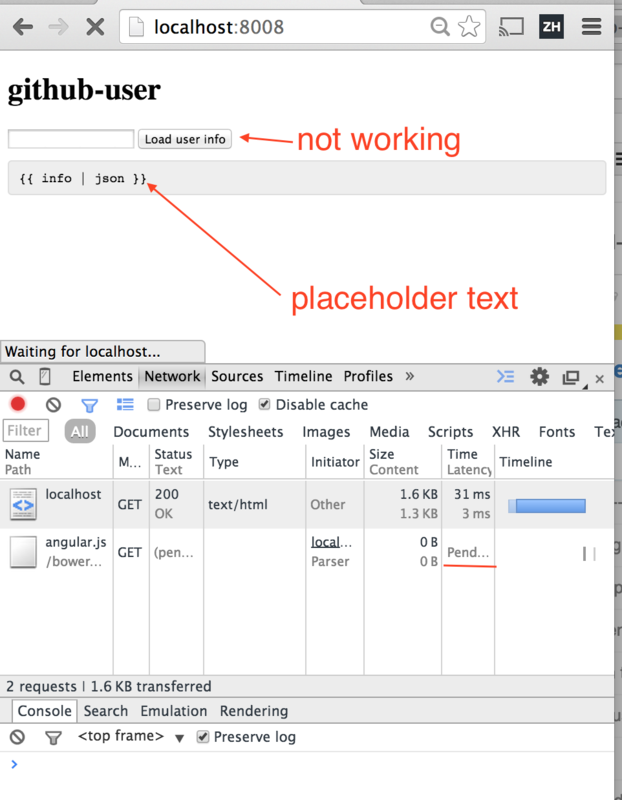 What happens if the angular.js file does not load? Does the page stay blank? Usually we load the script angular.js from a CDN, so it is likely that it will ultimately load, but there might be a significant delay. Let us simulate the delay in loading angular.js using a proxy and see how the web page looks while the request is pending. The turtles.json is very simple. It tells the proxy where to forward requests to, and for each matching url pattern what to return / delay amount. In this case angular.js script will be loaded after 5 seconds. The turtle-run sits between the local server and the user's browser, intercepting every request and deciding how to proceed. Most of the requests are just forwarded to the target. The requests matching the /angular\.js/ regular expression are forwarded to the target server after 5 seconds. Note: the Ajax request to the Github API is NOT proxied by the turtle-run because it is a direct cross-domain request from the page to the Github API endpoint. Notice that the page stays blank for 5 seconds before anything appears! This is because the proxy slows down bower_components/angular/angular.js script, returning the script after 5 seconds. The script is included in the head element and is blocking the rest of the page from loading. We can solve this problem by moving the script to the bottom of the page (or by adding async attribute). After moving the angular.js to the bottom of the body tag, the page loads right away, despite the delay. Unfortunately, this shows a few new problems. We can hide the application until it is ready to interact with the user using ng-cloak directive. To make the directive work, we include the angular CSS file in the head element (this small file will be blocking load), and then apply the cloak directive to the angular part of the page. Now even if the angular.js takes a long time to load, the user will see the initial page content. Then the Angular application will reveal itself. You can see the changed code at tag step-2. Using turtle-run one can make the application more robust to network and server errors. Read Give browser a chance for other suggestions how to work around the delayed or missing page information. Enable "Enable experimental Web Platform features." You can grab the code and run the application with the included service-turtle by checking out step-3 and running http-server locally using http-server -p 3003. When running the local server, the page loads turtle.js, which in turn initializes the service worker using script service-turtle.js. Every Ajax request from the page then generates fetch event inside the ServiceWorker. The worker can let the fetch event pass, letting the request through. The worker can also respond to the event with fake data using event.respondWith method. The object turtle registered from the bower_components/service-turtle/turtle.js script sends the arguments to the service worker by posting a message. The execution example (first the normal request, then the mocked one) is shown below. In the next example, we can mock /users request to return server error 500. Notice that the error is only printed to the console log, no user message appears and the result of the previous fetch is still displayed. Thus the application will NOT handle Github server errors in a user-friendly manner. Now the user will know something bad has happened and will not wait or be confused by previous data. 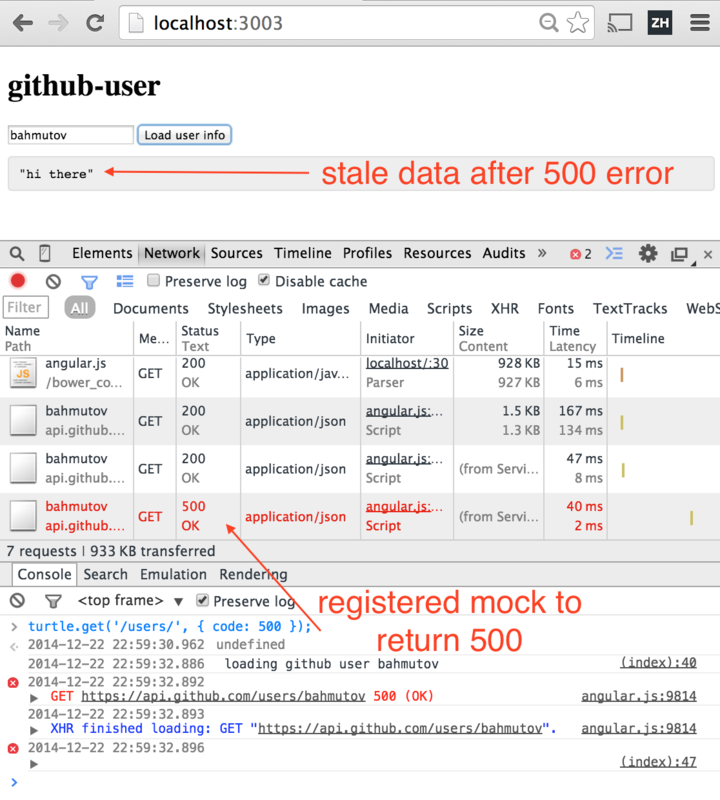 I plan to extend service-turtle to cover POST, DELETE, PUT and PATCH methods to allow mocking any request. Even with just GET method support, the service-turtle seems a very powerful tool at the cost of including a very small script. The inclusion could be limited to the development and the staging environments for security. The service workers are already limited to be loaded from safe urls: localhost or https. This prevents me from demoing this feature from the Github pages, since it does not support SSL. It is important to know the response schema you might want to mock, otherwise you are in for a surprise. What if we cannot run a proxy between the client and the server (like turtle-run works) and do not want to include a separate ServiceWorker (like service-turtle does)? What if we do not even want to reload our web application, but just want to mock a response? Seems like an impossible task - hooking into the live application and changing its behavior. Luckily, in case of AngularJS application we can do such substitution on the fly. Other frameworks could potentially work too, but for now I use mostly AngularJS so I will concentrate on this framework. A typical application (like our github-user) has a $scope object. The $scope object is initialized inside a controller function. The controller also injects $http service object. This $http object is used to perform all Ajax requests. We can get the reference to the actual $scope object from the browser's console at any moment. // Hmm, how can we access the $http argument passed into ctrl function? Fortunately this is possible via Faking lexical scope method. In principle we convert the actual method $scope.load to its source code using .toString(), then eval it back but prepend the source code with mock $http variable. Any variable eval does not find in the source are plucked from the lexical scope of the place where the eval is called. Notice that there is no actual HTTP request in the network tab - the request is intercepted before the Ajax request happens. 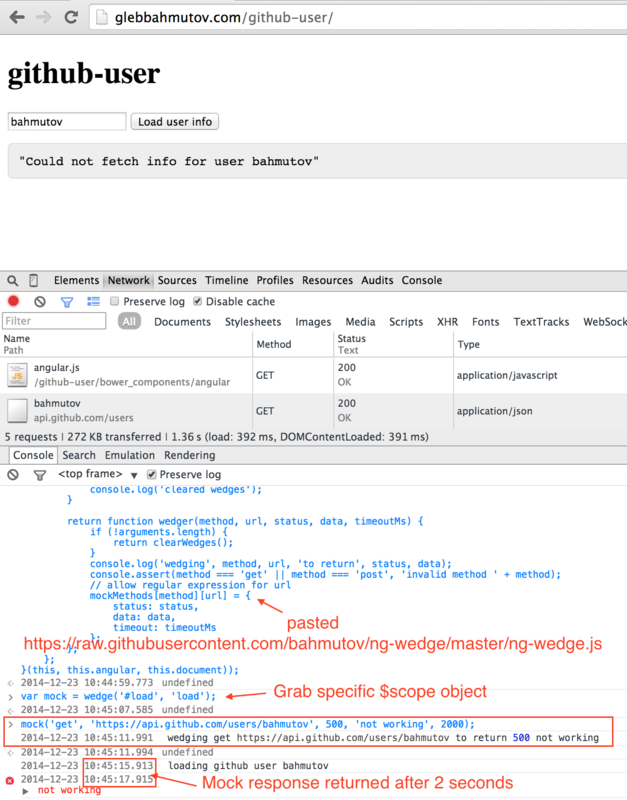 Any other Ajax request, even to the same Github API endpoint happening through other $scope objects would NOT be intercepted by ng-wedge. It only replaces a particular method on a specific $scope instance. I created 3 different proxy tools for conveniently mocking server responses. turtle-run - a stand alone proxy between the user and the server. Does not require any modifications to the server code to run. The user needs to access the proxy URL instead of the actual server url. The proxy cannot work with https servers or proxy cross-domain requests. service-turtle - a good choice for local development. Requires using the latest version of Chrome browser and turning on an experimental feature support. It is powerful and simple to control on demand, the code is still under development. ng-wedge - a good choice for a developer when investigating the production website's behavior. Does not require adding extra libraries or even reloading the page. Currently works with AngularJS web applications only, but could be adapted to other frameworks. Requires a "simple" controller code that can be reused in eval call.